There is no better way to soothe away the stress from the day than taking a long and leisurely soak in the bathtub. However, if your tub is dirty, it might be the thing that is stressing you out the most. Baths are magnets for soap scum, grime, mold, and mildew, as well as stubborn stains. Having a stained and dirty tub can make the entire bathroom feel unclean. 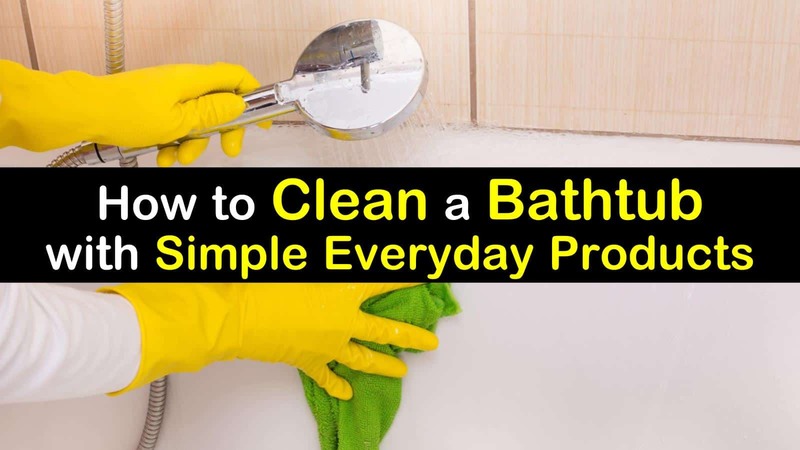 Fortunately, with just a few simple everyday products you can learn how to clean a bathtub properly and get back to soaking your stress away. The best way to clean bathtub is with simple, non-toxic ingredients that you can find in your home. With the right ingredients and a little elbow grease, cleaning your tub is an easy feat to accomplish. 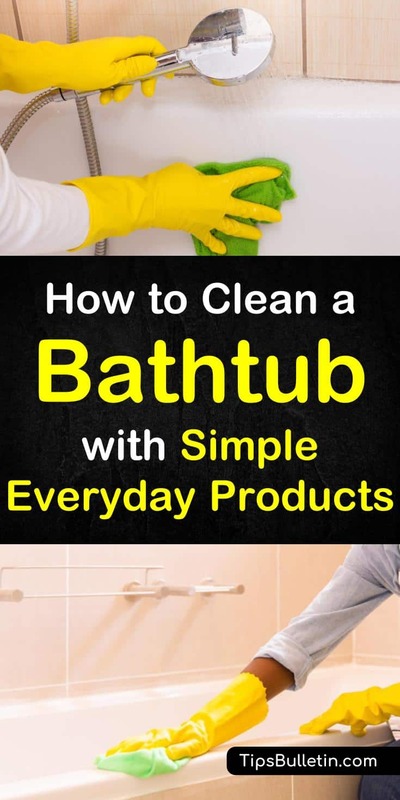 Learn what the best way to clean a bathtub is and how to make a homemade bathtub cleaner using the product you already have at home. When you’re ready to clean your bath, skip the commercial cleaners that contain harsh chemicals and toxic ingredients. Instead, head to your pantry and grab the box of baking soda. Baking soda is a non-toxic, cleaning solution that can tackle even the toughest stains and bathtub rings. Wet a sponge with warm water and squeeze out the excess liquid. Liberally sprinkle baking soda on the sponge and begin scrubbing your bathtub. Start at the top rim and work your way down into the base of the tub, using a circular motion. Continue to rinse out the sponge and reapply baking soda as needed. Be sure to pay close attention to the drain and area under the faucet where water tends to drip. If the bottom of the tub is especially dirty because of the non-slip surface, wet the bottom of the tub and sprinkle baking soda directly over the base. Allow the baking soda to sit for at least an hour, so it has time to penetrate the dirt and grime. Take the sponge and re-scrub the entire bath and then rinse with cold running water to remove the baking soda residue. Add the vinegar to a large microwavable bowl or measuring cup. Add the cornstarch to the vinegar. Use a fork to stir the ingredients until the cornstarch dissolves and they are thoroughly combined. Place the container in the microwave and cook for two minutes. Add the dish soap to the spray bottle. Remove the vinegar and cornstarch from the microwave and let cool slightly. Pour the liquid into the spray bottle, over the dish soap. Gently shake the bottle to combine the ingredients. Place the top back on the spray bottle. Spray the soap scum remover in the bathtub and let stand for 10 to 15 minutes. Using a sponge or washcloth, wash down the tub. Rinse with warm water. White vinegar isn’t merely a staple in your pantry. It’s also a safe and natural alternative to the harsh commercial bathroom cleaning products that contain toxic ingredients. Vinegar is a great cleaner that can tackle nearly every surface in your bathroom, from the toilet bowl to the bathtub to the shower door. The high acidity of the vinegar will help to loosen mineral deposits from hard water and dissolve soap scum. Mix the DIY bathtub cleaner in a spray bottle, add the vinegar, distilled water, and dish soap. Replace the lid and gently shake to combine the ingredients. Spray the entire surface of the bathtub. With a nylon scrub brush, scrub the whole bath. The nylon brush is slightly abrasive making it easier to cut through the soap scum and dirt without scratching the surface of the tub. Rinse the inside of the tub with hot water. You can also use these homemade shower cleaners to tackle hard water stains from bathroom countertops, sinks, shower curtains, glass shower doors, mirrors, and the toilet bowl. Bleach has long been used to clean bathrooms because of its ability to kill fungus, mold, and mildew, as well as killing viruses, bacteria, and other germs. It will not only work to clean acrylic tubs and a plastic bathtub but will work wonders on a jetted tub or spa tub as well. Before you begin to clean your tub with bleach it is vital to make sure you are working in a well-ventilated area, so you don’t become overwhelmed by the bleach fumes. Turn on the exhaust fan if you don’t have a window to open and consider putting on a face mask as an extra precaution. To prevent the bleach from coming in contact with your skin, be sure to wear rubber gloves and avoid touching your eyes to avoid damaging your eyes. Start by rinsing the tub with warm water. In a large bucket mix one gallon of water with ½ a cup of bleach. Use a soft cloth to wipe down the bathtub with the solution. Allow the bleach to sit for five minutes or more. Rinse the tub with cold water and use a dry towel to wipe dry. To remove built-up residue and tough soap scum, form a paste using a small amount of bleach and baking soda. Rub the paste into the stains and let stand for 15 minutes. Slightly wet the paste with water and use a cleaning brush to gently rub the tub in a circular motion until you remove the paste residue. Rinse the bath with cold water and dry. If you’re looking for a way to clean your bathtub without scrubbing, Borax is your answer. Like baking soda, Borax has long been considered a workhorse in the cleaning world. Borax, when mix with hot water, ends up converting some of its molecules into hydrogen peroxide, which helps to bleach and clean. To use borax to tackle hard water stains, soap scum, and rust stains, merely sprinkle the bottom of the tub. It is part of a special rust remover for tubs we covered previously. Using a sponge or soft bristled brush, gently scrub it into the surface of the tub, then rinse with warm water to remove the residue. Pour the first four ingredients into a spray bottle. Next, slowly add the water. Place the top of the spray bottle back on and carefully mix the ingredients by gently shaking the bottle. Spray the surface of the bathtub after every use. There is no need to rinse the cleaner or wipe it from the surface. Fiberglass tubs need to be treated differently than porcelain tubs when cleaning. Unlike a porcelain tub, using an abrasive cleaner can cause damage to the surface of the bathtub. Start by filling a bucket or basin with warm water. Add some baking soda and vinegar to the water and stir to combine. Use a sponge dipped in the cleaning solution to gently clean the surfaces of the bathtub. Rinse the surface with warm water, being sure to remove any residue. Follow up with a daily bathtub cleaner, like the one above. For extra stubborn dirt, you can create a cleaning paste by combining baking soda and water. Use a damp sponge to rub the paste into the trouble spots gently. Rinse the area with water and repeat if necessary. Cleaning the bathtub and your bathroom is one chore that many people dislike doing, but if you want to enjoy a nice relaxing bath at the end of a long, stressful day, it’s necessary to keep the tub clean. These simple, hacks show you how to clean even the dirtiest of bathtubs with little effort. We hope you enjoyed learning how to clean a bathtub with every day, environmentally friendly products. If you found the information in this article helpful, please don’t hesitate to share it will all your friends and family.